DocuSign keeps business moving forward. With its eSignature solution and Digital Transaction Management (DTM) platform, the company is changing how business gets done by empowering more than 225,000 companies and more than 85 million users in 188 countries to sign, send and manage documents – anytime, anywhere, on any device – with trust and confidence. DocuSign replaces printing, faxing, scanning and overnighting documents with the easiest, fastest, most trusted way to make every approval, decision, workflow and signature 100% digital. DocuSign needed a true growth partner to support program expansion internationally and in mobile. More than 85,000 new unique users join DocuSign every day – so much so that DocuSign has become a verb for getting business done fast in many industries. Need to close on a home? DocuSign it. Open a new account with your nancial advisor? DocuSign it. Charged with getting new people to try DocuSign, Amy Wong, Director of Web Acquisition, reaches new users through a variety of web acquisition channels (search, display, etc.). DocuSign saw an opportunity to scale and engage high quality buyers by tapping into word-of-mouth referrals experience. In keeping with its vision of enabling forward business momentum, DocuSign looked for a partner in the referral marketing industry with deep experience, growth potential and an innovative mindset. DocuSign worked with Extole because of the company’s roster of exemplary enterprise brands and its best practices for handling complex environments ripe with regulatory, security and privacy concerns. DocuSign also sought a true growth partner to support program expansion internationally and in mobile. 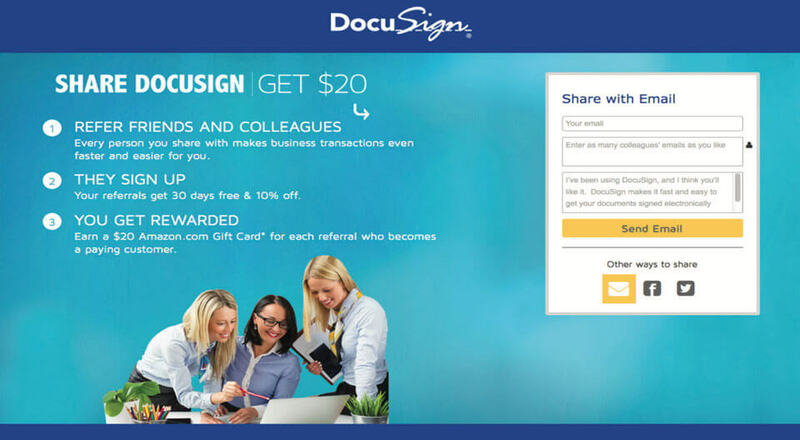 With Extole’s referral marketing platform, DocuSign expanded referral opportunities and benefits, engaging existing customers to share their experience and refer others to try DocuSign. DocuSign leverages Extole to identify and reach specific audiences through their existing customer base. These word-of-mouth advocates are able to formalize the referrals they were already making and earn rewards through Extole. DocuSign is able to identify and track advocates through share statistics and, via the Extole dashboard, read the personal comments sent alongside each share. This visibility enables DocuSign to capture customer feedback and make enhancements to ensure future referrals, and more. DocuSign fosters constant engagement and nurturing through the Extole platform. They’re able to reach the exact user base they are looking for with better or equal ROI compared to other acquisition channels. While many companies may assume that referral marketing is not measurable, Extole proves that not only is it measurable, but its performance is on par or better than other acquisition channels. By working with Extole, DocuSign was able to turn on an out-of-the-box solution with the look and feel that the brand required. New leads, best practices, and a seamless user experience for both the administrator and the end-users saved the company time and money that could be put towards engaging even more satis ed and loyal customers. 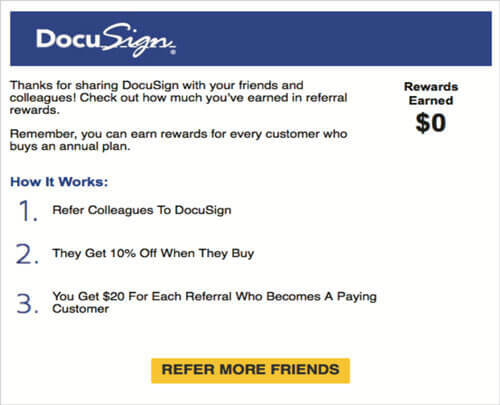 Both DocuSign and Extole take a data-driven approach to referral marketing. Together the companies conduct frequent tests to optimize the program’s performance and expand its reach. For DocuSign, working with Extole has exceeded expectations as referral marketing has enabled the company to reach and convert new trial users through existing, loyal DocuSign customers. These high-quality customers become long-term users of DocuSign themselves and are likely to refer the product, as well. With greater program exposure across channels, the referral marketing program at DocuSign, powered by Extole, is poised for continued growth in the U.S. and beyond.